In his message for the World Day of Social Justice, Ban Ki-moon, the Secretary-General of the United Nations, said: With exclusion and inequality on the rise, we must step up efforts to ensure that all people, without discrimination, are able to access opportunities to improve their lives and those of others. As a concept, social justice stresses on equality in terms of wealth distribution, opportunities, and privileges in a society. While that may seem elementary, it’s something that our society needs to be reminded of, every now and then, and that’s why 20th of February every year is observed as the World Day of Social Justice. On paper, it definitely comes across as something noble—the concept that is, and it’s highly unlikely that you will come across someone who doesn’t speak in its favor. However, when it comes to application, even the ardent supporters of the concept tend to falter; courtesy, inherent bias. The divide between haves and have-nots is perhaps nowhere as stark as it is in schools in our country. Imagine, during the lunch break, some children are eating from their lunch boxes, while some have to settle with water, as they can’t afford food. It may come as a surprise, but that was exactly the case in several parts of the country until recently. Then came the Mid-day Meal Scheme (MDMS), to implement which the Government of India got into a partnership with certain NGOs; The Akshaya Patra Foundation (TAPF) being one of them. It brought about a positive change in our society and took us a step closer towards a world where there would be no need to observe a day to remind us of the importance of social justice. Having said that, it’s important to note that Akshaya Patra had set on this path long before the Mid-day Meal Scheme was initiated. It came into being in the year 2000 and 15 years down, has reached far and wide. The pan-India spread of Akshaya Patra, with 24 kitchens across ten states, serving over 1.5 million children in over 11,000 schools every day, means there is no scope to falter. It’s doesn’t make sense to have a wide reach, if you are not able to adapt to the requirements of different regions. Therefore, regardless of whether it is Baran in Rajasthan or Chennai in Tamil Nadu, Akshaya Patra thrives to stay true to the local preferences, which is why the diet is wheat-based in North India and rice-based in the south. It’s always important to walk the talk; all the more when it comes to social justice, and Akshaya Patra, with improving socialisation among castes as one of its objectives, does that and more. In fact, Akshaya Patra prides itself in being a secular organisation. In a country where caste has long been reinforced in the social fibre, it’s important to put in efforts to break the caste divide. What better way to do that, but to use meals to bring children together—staying true to the phrase, bonding over food. We often hear about how Akshaya Patra thrives to address issues like hunger and malnutrition in the country by eliminating classroom hunger. While the focus is indeed on eliminating classroom hunger and at the same time, improving enrolment and attendance, it doesn’t mean its impact is restricted to the field of education and nutrition. There are other areas where the organisation is having an impact; promoting socialisation among castes is one of them; facilitating women empowerment by providing employment opportunities is another. Be our catalysts of change! Every year on 26 January India ardently gears up to celebrate its Republic Day with invigorated zeal and honour to mark the evolution of a ‘Republic India’ from British hegemony. The flavour of the day is showcased by royal parades, spectacular aerobatics by Indian fighter jets showcasing cultural wealth, martial supremacy and sky soaring patriotic fervour. It is a day of celebration for every Indian as Indian citizens unitedly celebrate this day by putting cultural and communal differences in their backseat. But in the midst of festivity and gala we often become oblivious of the fact that though we have attained sovereignty there are certain teething challenges in India that have been a concern for the nation since its inception. One such challenge is food insecurity leading to poverty and malnutrition. The day food insecurity will cease to prevail in India; citizens will witness a new dawn of a truly republic and welfare India. Hence recognising the importance of eradicating hunger and malnutrition, we at the Akshaya Patra family since 2000 have made continual strides to feed as many children we can through our Mid-Day Meal Programme. We humbly started with feeding 1500 children and today we are feeding 1.58 million children every day across India. Education is our right too! For women the most straightforward and rational path to empowerment is education! With education comes the immediate benefit of empowered girls who can participate equally like men in the political, social, cultural and economic affairs of one’s country. The benefit of educated girls does not limit to well-establishment on an individual level but it also leads to the depth and quality of a nation’s workforce. According to a recent study conducted in 95 nations by the McKinsey Global Institute (MGI) reported that “India can increase its 2025 gross domestic product (GDP), estimated at $4.83 trillion, by between 16% and 60% simply by enabling women to participate in the economy on par with men.” Sadly India records as a nation with one of the world’s largest gender gaps in matters of labour force participation generating a mere of only 17% of India’s GDP. This gender gap leads to condense or no education for girls at all. These factors have only intensified with time leading to girls being deprived of education, their only roadway to empowerment, gender equality, greater financial independence, security and freedom from violence and discrimination. Hence, India since Independence has made continuous strides to educate her girls and combat burning issues like gender based inequality, girls being confined to domestic thresholds, pressures of poverty halting girls’ education, reduced enrolment rates and high drop-out rates of girls in schools. India understands that a literate mother can function as a life source for her children as she can help her children identify importance of basic hygiene, sanitation and nutrition. Moreover she can also contribute considerably to her family’s income thereby ensuring financial security for the entire family. With these schemes in place, it is evident that the Government is definitely making efforts but it is time that we do our bit. On this National Girl Child Day, we could all work together to educate girls so that they can make decisions and influence community change in key areas thereby uplifting their own socio-economic status. At Akshaya Patra, we are determined to reach education to every girl child through our Mid-Day Meal Programme. Often, one wholesome meal a day is enough motivation for the child to come to school. ‘Educate girls to nurture society’ is what we believe in and every morsel served is to bring children closer to education. Shannu Kaw, Our New Member of Board of Advisors! Shannu Kaw, Director- Global Business Services at Cisco Systems has joined Akshaya Patra as an advisory member. She is a multi-faceted and dynamic business leader with over 19 years of rich experience in the Technology Industry across areas of Business Operations, Procurement, Product Development and Software Engineering. Shannu at present is functioning as Director, Global Business Services (GBS) at Cisco; she is in charge for managing Cisco’s Indirect spends in Asia Pacific and Japan which includes Strategic Partnerships, Procurement Operations, Spend Optimization and Procurement Relationship Management for the region. She in her 15+ years in Cisco has held various leadership positions which include Head of Global Partner Engineering and Contingent Labour, leading New Business Incubation and Software Development. Prior to Cisco, Shannu has worked with Huges Software Systems and GAIL. She is the founding member of the Cisco India Civic Council and leads Cisco’s giving back initiatives like the Global Hunger Relief Programme and School Adopt Programme. She is also on the advisory board of WeConnect India, an industry forum for supporting Supplier Diversity and Women Entrepreneurs. Shannu is an Alumnus of IIM-Bangalore (Executive General Management) and BITS Pilani (Electrical and Electronics Engineering). Beyond work, she is an avid reader and supports various social and community initiatives. Shannu’s business acumen and expert guidance will further propel Akshaya Patra to a glorious journey of sustainability and growth! Vicky Roy has had an interesting past. His life is a success story that is inspiring and captivating to not just the underprivileged, but to those who are on the path to success like our beneficiaries, and even those of us who could be considered blessed. Vicky ran away from home at the innocent age of 11 to escape the conditions of his life. He lived a life of a street child working as a rag picker and collecting bottles to be sold. He even worked in a street side restaurant washing dishes till he eventually found shelter in an NGO. This is where his life changed. In 2001 when his friend took part in a photography workshop, and visited Sri Lanka and Indonesia, Vicky became intrigued by the idea of photography. In fact, it was his desire to travel that led Vicky to discover his passion for photography, and follow this passion to the place where everything started – back to the streets. He took on his first project Street Dreams which was sponsored by the British High Commission. The exhibition was grand success, and travelled to London, South Africa and Vietnam. Showcasing the lives of street children and their dreams for a better future, Vicky’s personal experience and empathy allowed him to connect fully with the children of the street and bring his photographs to life. Vicky attended ICP (International Centre of Photography), the best photography school in the world, and was asked to photo document the reconstruction of the World Trade Center in New York City. Discovering a confidence in himself and his talent Vicky even found himself lunching with Prince Andrew in Buckingham Palace! Vicky’s life story is one of grit and determination; he is one of the famous speakers of TEDx and INK Talks. Even today Vicky has not forgotten his humble beginnings and mentors young beneficiaries at NGOs in the art of photography. Vicky extended this same generosity to Akshaya Patra when he worked with us pro bono. There is nothing more impressive than nurturing young minds in encouragement of social entrepreneurship. And that’s what the Jagriti Yatra, started by the not-for-profit organisation Jagriti Sewa Sansthan, is all about. This initiative is a 15 day journey across the length and breadth of India that culminates in the 450 entrepreneurs applying the lessons they have learnt in the Biz Gyan Tree initiative in the Deoria district of Uttar Pradesh. Through their travels so far these entrepreneurs have had the opportunity to understand the business model behind Karnataka’s Kalkeri Sangeet Vidyalaya which is powered through solar energy, been trained in brand building at Chennai’s Royal Enfield Factory and taught operations and scalability at Akshaya Patra’s kitchen in Visakhapatnam, amongst others. Akshaya Patra was extremely proud to have contributed to the education of these eager entrepreneurs. After these educational tours the participants will spend time in eight villages of Deoria speaking with local farmers, owners of small businesses and schools to devise business proposals. From these 20 proposals will be selected for a four month residential exercise in the month of March. Based on the best innovation, achievability and local relevance, the four best groups will be chosen and awarded a Rs. 1 lakh grant to help them start their business. These creative initiatives coupled with young inventive minds are certain to bring about a positive change in the lives of citizens all over India. Akshaya Patra is honoured to have been chosen as an example of innovation for this programme, and looks forward to future involvement in this worthy cause. Philanthropist billionaire Gururaj Deshpande was recently featured in an article by Forbes India. ‘Desh’ Deshpande as he is often called is well known for his Deshpande Foundation, and for his appointment to the Co-Chairmanship of the National Advisory Council on Innovation and Entrepreneurship by US President Barack Obama, amongst other significant achievements. Interestingly, Deshpande approaches philanthropy in much the same way as he does his role as an entrepreneur. “An idea does not have an impact unless it is directed at some burning problem in the world,” he told Forbes India in a telephone conversation from Boston. In 2008, the venture capitalist and entrepreneur took on the role of Chairman of the US wing of The Akshaya Patra Foundation. The kitchen in Deshpande’s hometown of Hubli was built as a joint effort a decade ago with contributions by the billionaire and his brother-in-law NR Narayana Murthy (co-founder of Infosys). However Deshpande does not contribute money towards the daily running of Akshaya Patra’s kitchens. Staying true to his ability to approach every philanthropic project with the heart of an entrepreneur Deshpande believes that the kitchens need to be able to support themselves. “I chair its fundraising committee in the US, but don’t contribute to daily expenses,” he says. Deshpande also goes on to explain how his thirty years as an entrepreneur have enabled him to view his philanthropic activities through the same lens. “As an entrepreneur, you need to identify a problem and scale up. The same holds true for this (philanthropy) space,” he says. Aside from working to eliminate classroom hunger in India, Akshaya Patra also tries to provide its services to other agencies in need of assistance. 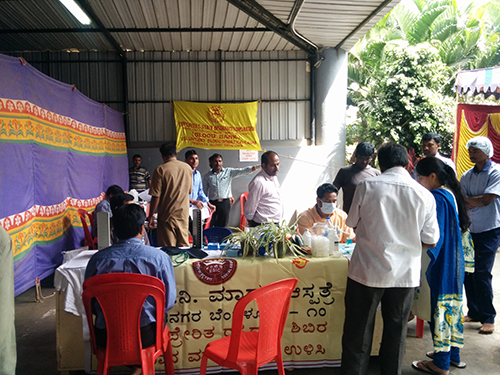 Recently Akshaya Patra conducted three blood donation camps in Karnataka to support hospitals in the area. The first blood camp was held on 25th June, 2014 at HK Hill with 56 participants donating blood to the programme. 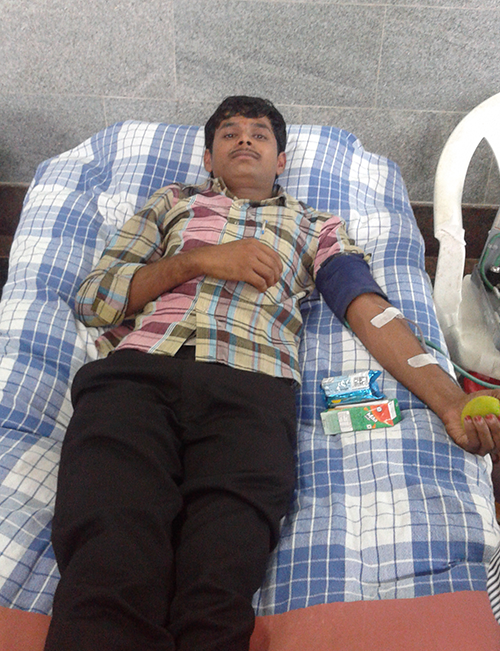 On 13th November, 2014 the blood camp at Bellary brought in a total of 50 donors. 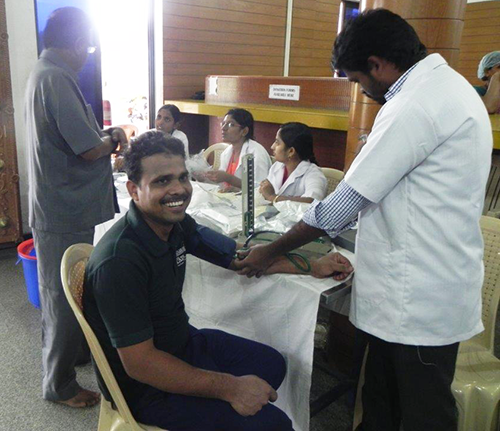 The blood camp at the Vasanthapura (VK Hill) was undertaken on 29th November, 2014 in association with ESI Hospital. A total number of 59 donors participated in the programme. We are thrilled to have been given an opportunity to provide assistance to such a worthy cause. We look forward to when we can next contribute in any way we can. Akshaya Patra received the SAFA Best Presented Annual Report Awards 2013 in the Non-Governmental Organizations (including NPOs) category, standing first of all the SAARC countries participating! This is yet another wonderful affirmation of the high standards the Foundation upholds in financial accounting. The award was conferred to Akshaya Patra after evaluation based on Improvement in Transparency, Accountability and Governance exemplified in the published annual reports submitted from South Asian countries. The award was handed over to Akshaya Patra on 4th December at Bhubaneshwar, and was received by Achytya Krishna, on behalf of the Foundation. This is the fifth consecutive year that Akshaya Patra is winning a SAFA award for its Annual Report. In 2008-09 the Foundation won the Certificate of Merit, 2009-10 the 2nd Runner-Up, 2010-11 the Gold Award and 2011-12 the Silver Award. Speaking on the occasion Chanchalapathi Dasa, Vice-Chairman of Akshaya Patra said, “We are honoured to have received this prestigious award, SAFA Best Presented Annual Report Awards 2013. This is indeed a testimony to our adherence to the highest standards of governance philosophy and our continuous strive for excellence by adopting the best practices. The award encourages us to keep performing efficiently and ethically”. 2014-15 has been a year of ideation and innovation for the Akshaya Patra team. We’ve pushed boundaries and the keywords all through were Engage, Excite and Entice! Here’s a recap of some of the things we have achieved in the last twelve months. Website and Microsite: We redid the Akshaya Patra website to feature better design and content, along with 7 regional and 4 international language microsites. Blog: We redesigned the blog making it more interactive, featuring more frequent and relevant content with a macro perspective on issues. Online ads: Upgraded the design quality and content of our online ads which are updated regularly on Google, Yahoo and private ad networks. Online contests: Developed engaging and creative microsites to run two month-long online contests. Click a Smile, Akshaya Patra’s annual photography contest allows contestants to upload their best three entries for judging by an expert panel. In 2013 the contest received over 700 entries worldwide. Click a Smile 2014 closes entries on 22 December, 2014.The blogging competition held in collaboration with BlogAdda had entries flooding in as contestants vied to be among the top five bloggers chosen, and to help eliminate classroom hunger at the same time. For every post entered BlogAdda would feed one Akshaya Patra beneficiary for an entire year. Social Media Posts: This year saw a concentrated effort in producing fresh, engaging and informative posts via social media, which resulted in Facebook page likes going up by almost 40,000 and Twitter followers by close to 3,000 since January 2014. #HungryForSchool was a three-month long social media campaign focused on raising awareness between the connection between hunger and education. The campaign received an overwhelming response with Facebook page likes going up by almost 12,000, famous personalities like Deepak Chopra endorsing and sharing our cause, and of course donations going up as well. Newsletters and Emailers: Improved the creativity and content of the organisation’s internal, fortnightly and quarterly newsletters, which have consequently received positive feedback from our stakeholders. Annual Report 2013-14: After receiving numerous awards for creativity and financial reporting last year, we have pushed the envelope to create something even better for this year. The annual report is scheduled for release in a few days. 2015 Calendar: Based on the theme ‘Makers of India: People who made it BIG’ the calendar features successful personalities from the country like Bollywood celebrity Parineeti Chopra, athlete PT Usha and more posing with the children. Hackathon: We also stepped out of our usual comfort zone and participated in the JP Morgan Chase ‘Code for Good’ and the Google ‘Code for India’ hackathons and presented challenges to the participants. These events were not just innovative but fascinating as well! Production of 3 online films: This year we have produced three films, Morsel of Love which highlights how each mouthful of food is prepared for the children with a mother’s love for her child, What can you get for Rs. 750? which showcases that many things may be unaffordable with Rs. 750, but feeding a child for a whole year is not, and The Possibilities which tells us about the struggles some children face every day to get one square meal together. These are some of the highlights of 2014 from us at Akshaya Patra. It’s been a huge learning curve for us and we’re excited to continue down this journey we’ve begun. So stay logged in to our blog for more updates.